Includes back up keys and 4 AAA (1.5V) batteries. Store firearms and other valuables under the bed and out of site. Use to keep guns, jewelry, weapons and important documents safe and close. 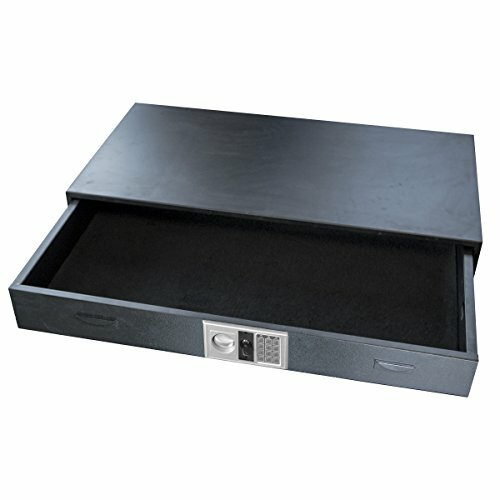 Felt-lined drawer can hold up to 100 lbs. of weight. Programmable digital lock can be set with any 3 to 8 numeral combination. Constructed of 14 gauge (2mm thick) steel, with pry resistant door. No fire rating, intended for secure storage and theft prevention only. Warranty: One year limited. Made from steel. No assembly required. Interior slide-out drawer: 46 in. W x 26 in. D x 5 in. H in. with 3 cu. ft. of storage space. Overall: 48 in. W x 28 in. D x 7 in. H (130 lbs. ).